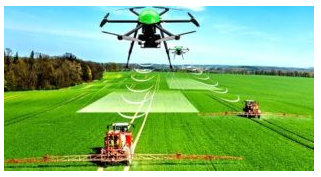 Over the next two decades, a technological wave will revolutionize the efficiency of farms all over the world. It can’t come soon enough. By the year 2050 the human population will be nearly 10 billion—which means we’ll need to have doubled the amount of food we now produce. This is an examination of the agricultural innovations coming down the pipeline that will help get us there. The industry has undergone major developments over the last century. 100 years ago, farming looked like this. Today, it looks like this. And tomorrow, it will look something like this. These changes have allowed many of us to do other things with our lives. In 1900, million agricultural workers produced the food for 76 million people. Today, just million workers feed 3million Americans. Two factors were most responsible for this surge in productivity: engines and the widespread availability of electricity. Today, the innovations on our immediate horizon include autonomous pickers—UK researchers have already created one that gathers strawberries twice as fast as humans, the challenge will be creating robotic pickers that can switch between all kinds of crops; Robots or drones that can precisely remove weeds or shoot them with a targeted spritz of pesticide, using 90% less chemicals than a conventional blanket sprayer. For the organic farmer, they could zap the weeds with a laser instead. This could have a big impact, the UN estimates that each year, between 20 and 40% of global crop yields are destroyed by pests and disease. Tiny sensors and cameras will monitor crop growth and alert farmers on their smartphones if there’s a problem, or when it’s the best time to harvest; The BoniRob can take a soil sample, liquidize it, then analyze its pH and phosphorous levels—all in real time; As a proof-of-concept for all this autonomous farming technology, researchers at Harper Adams in the UK plan to grow and harvest an entire hectare of Barley without humans ever entering the field. Companies like Agribotix have already commercialized software that analyzes drone-captured infrared images to spot unhealthy vegetation. Then, like a real life game of “Sim-Farmer,” the grower is alerted on their device when a troubled area is identified. Machine learning will regularly improve the system’s ability to differentiate between varieties of crops and the weeds that threaten them. Not to be left out, a company called Mavrx contracts 100 pilots to fly light-aircraft that are outfitted with multispectral cameras on data-gathering missions over large farms throughout the country; For an even wider view, PlanetLabs operates a fleet of CubeSats that take weekly images of entire farms from space to help monitor crops; Other companies are creating analytics software to act as farm-management systems, allowing growers of all sizes to deal with this new tsunami of data; And The Farmer’s Business Network combines data from many farms into one giant pool to give its members the power of macro-level insights that have traditionally only been available to corporate mega-farms; Vertical farms are essentially warehouses with stacks of hydroponic systems to grow leafy greens. They’re sprouting up in cities all over the world where fresh produce — and land — is scarce. The key obstacle here is the cost of energy, and the toll using a lot of it takes on the environment. The upside is that artificial lights and climate controlled buildings allow crops to grow day and night, year-round, producing a significantly higher yield per square foot than an outdoor farm. For now though, only expensive, leafy greens like lettuce — or herbs like basil — have proven profitable in the vertical system. And the jury is definitely still out on whether this is truly and environmentally-friendly technique; One possible solution is to use blue and red light wavelengths to optimize photosynthesis and turbo-boost growth—a technique tested by researchers at project Growing Underground, an experimental farm operating in old World War II bomb shelters underneath London; Another advancement in indoor farming is the Open Agriculture Initiative, which aims to create a “catalogue of climates” so temperature and humidity can be set to recreate the perfect conditions for growing crops that would normally come from all over the world, locally instead. This is an attempt to tackle the “food miles” issue. When produce is shipped around the world it creates unnecessary CO2 emissions. Just look at a where a few of the items you eat today were cultivated to understand how big of a problem this is. The millions of people entering the middle class every year in developing countries are demanding tens of millions of pounds of additional meat. These ideas aim to get the most from every animal. Who would’ve thought Fitbits could be for livestock too? Cows are being fitted with smart collars that monitor if they’re sick or, if they’re moving around more, which is a sign of fertility; Researchers at Scotland’s Rural College are analyzing cow breath. Exhaled ketones and sulfides reveal potential problems with an animal’s diet; Thermal imaging cameras spot inflamed udders to provide earlier treatment to combat a bacterial infection known as mastitis, one of the costliest setbacks in the dairy industry; 3-D cameras that quickly measure the weight and muscle mass of cattle so they’re sold at their beefiest; Companies have even begun positioning microphones above pig pens to detect caughs, giving sick animals the treatment they need a full 12 days earlier than before. Less antibiotics are used if fewer animals become ill for shorter lengths of time; And a system of just three cameras, developed by researchers in Belgium, tracks the movements of thousands of chickens to analyze their behavior and spot over 90% of possible problems; Here’s a stat that I found eye-opening: consumption of farmed fish has now surpassed our consumption of beef. Researchers are working to increase the types of fish that are raised. Aquaculturists at the Institute of Marine and Environmental Technology in Baltimore are developing an artificial ecosystem that mimics ocean conditions so that saltwater fish farms can be built inland. This would allow millions of landlocked people to be able to enjoy fresh fish, instead of consuming frozen fish grown or caught on the coast that have to be shipped thousands of miles in refrigerated trucks that use a lot of energy. The most exciting thing about this experimental fish farm is that it’s actually a closed system that creatively uses three sets of bacteria in different ways to so it doesn’t produce any waste and even powers itself. : “This is the world’s most sustainably produced fish. The system is completely and fully contained. There is zero interaction with the environment. There is no waste. Zero waste goes back to the environment, which is the big problem with aquaculture today.” This revolutionary technique could be critical for saving species in the wild, like rapidly depleting bluefin tuna populations, without curbing the appetites of sushi lovers like me; Another ingenious approach from a company in California are proteinaceous fish food pellets made from the bodies of a bacteria that grow by consuming a combination of methane, oxygen, and nitrogen. The UN’s Food and Agriculture Organization estimates that 2 billion people consume insects as part of their diet. : “I eat insects like this because they provide nutrition. The nourish the body, they are not too fatty but have lots of good ingredients. If you eat these all the time, you will get sick very rarely.” Bugs are among the cheapest, most nutritious, environmentally-friendly sources of protein. So there’s a growing movement to find new ways to incorporate them into food products that can be marketed in a way that doesn’t gross people out. Some examples are protein powder and insect flour. But even if insects never make it onto many of our plates, they can still help us a lot as animal feed; On the other end of the alternative protein spectrum is lab grown meat. In 2013 the first hamburger was made from muscle cells grown in a lab in the Netherlands, followed by a meatball grown by a California company called Memphis Meats. These grabbed headlines, but production costs need to come way down before we’ll be buying synthetic meats in significant quantities. : “So it’s better for the environment. And we need much less resources to actually produce it so that we can produce much more meat with much less resources so that we can feed the entire planet. And we’ll probably look back at this time as sort of barbaric, that we still killed animals and used animals to such a degree for our meat consumption.” Human survival on earth has, by necessity, driven us to use–and change–the world around us. Some of our most powerful innovations are aimed at solving problems we ourselves create. As climate patterns change and human population rises, the prospect of a global food shortage becomes increasingly dire–it’s a threat that even the deployment of millions of autonomous farmer-bots would be unlikely to solve. But where man-made machines may fall short, bacterial machines may very well prevail…bringing me to the technology that can continue to deliver the biggest increases in crop yield: genetic modification. Scientific breakthroughs like CRISPR, genomic selection, and SNP’s now allow single letters within a gene to be precisely edited. Unlike older methods of genetic manipulation, like transgenic modifications that made uncontrolled alterations to large regions of DNA, CRISPR — a gene editing system repurposed from bacteria — more closely mimics the process of random mutation. This process is critical for environmental adaptation, Darwinian natural selection, and — ultimately — evolution. While this fact alone may not placate the most passionate anti-GMO advocate, highly precise techniques, like CRISPR should help ease the legitimate health and environmental concerns that have thus far curbed significant commercial investments. But not everyone is sitting on the sidelines. Two large agricultural companies, DuPont and Syngenta, have used genome selection to develop two new, drought-tolerant strains of corn called AQUAmax and Artesian. Then there’s the NextGen Cassava project led by Cornell University, in partnership with research institutes all over Africa, that aims to “significantly increase the rate of genetic improvement in cassava breeding to unlock the full potential of this staple crop that’s central to food security and livelihoods across Africa.” Genetically improving the cultivation of other crops that haven’t been modified yet could additionally lead to huge yield increases for millet and yams, for example; Rice, one of the world’s most important crops, has seen its yield plateau—meaning that, for years now, the maximum amount that can be grow on, say, an acre of land has not increased. The C4 Rice Project — a massive global collaboration between 18 biology labs spread across four continents — is trying to change that. Their goal is to genetically engineer a new strain of rice so that its photosynthetic process works more like maize, which would — theoretically — turbo boost its yield by 50%. And, of course, it’s not just crops, pig lines are being altered to make them immune to an illness that costs American farmers $600m a year. While it is hard to predict which of these developments will have the greatest impact on food production, we should be pursuing all of them. The use of genetic technologies will, inevitably, prove essential for tackling what would likely be an insurmountable challenge, sustainably doubling our global food supply. The good news is that some of the world’s most creative scientists, engineers, farmers, and innovators are working on solutions for this problem, even as you watch this video. This piece was based on articles that recently appeared in the The Economist and the journal Nature. And our recent video on India’s highway megaproject led some of you to suggest other projects for us to look into. Your suggestions for video topics are always appreciated. Thanks for watching. Until next time, for TDC, I’m Bryce Plank. .